Getting into Google News is a big deal. If you get one of your sites into Google News, it probably means that you run a very high-quality and informative web property. Google is very particular about which sites they let into Google News. I won't delve into exactly how you get a site listed in Google News; there are informative articles out there that cover the process much better than I could. This article is for the people who have recently been included in Google News and would like to know exactly what the benefits are. 1. Traffic from Google News. Ok, this one is obvious. Google News is a very popular web property, and you will notice an uptick in your traffic immediately upon being granted inclusion. If you happen to write about a topic that is timely, you will notice a big increase in your traffic. 2. Increased links. 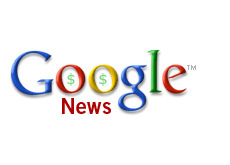 Many web sites and blogs will scour Google News to come up with ideas for new stories. If they are upstanding web citizens, they will give you credit for your stories in the form of a one-way link to your web site. One-way deep-linking from many different quality web sites is just about the best way to climb up the SERP's. When we write an article about something that is timely and in the news, we can expect dozens of one way links just from that one story. You can imagine the positive impact on a web site that posts 1-2 articles per day that is listed in Google News. 3. Increased "Google Juice." Obviously we can't be 100% sure about this, but I would find it hard to imagine that Google wouldn't give some extra weighting in their ranking algorithm to sites that are listed in Google News. It makes sense - Google is all about rewarding authority sites that provide fresh, unique content. Being an authority site with fresh and unique content are some of the criteria for being listed in Google News. It just makes sense to me. 4. Increased authority status. If you are listed in Google News, you will be viewed upon in your niche as being an "authority site." More people will link to your site, more people will book-mark your site and return on a daily basis, and Google (and other search engines) will reward your site in the SERPs. It's win/win. 5. Rapid indexing of articles. One of the biggest advantages of being listed in Google News. If I write an article, not only does Google News include it in their index almost immediately (usually 10 minutes upon writing the article), but the article will also be included in the main Google index at the same time as well. Imagine the benefits of being one of the first to report on a breaking news story, and not only do you appear in Google News for the topic, but you are the #1 listed site in Google's main index for the same topic? This is one of the biggest advantages of being listed in Google News. Getting into Google News is not easy, but if you persevere and follow the guidelines, you should eventually get in. If you are frustrated that you can't get in, don't be - the fact that Google is so picky about who they let in is to your benefit once you do get your site listed.